Note: this preliminary version is typed directly from my notes and has not been test-knitted by anyone but me. Even in worsted weight yarn it's a small cap, and I hope to rewrite it. Please let me know at the email below if you find errors or confusions! © Judy Gibson, 2006 This chullo-style cap is worked in the Eye of the Partridge stitch to give an extra-warm double thickness of fabric. This slip-stitch pattern also permits a variety of color patterns to be worked by knitting only one color at a time. 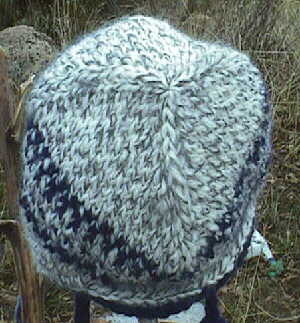 Sample shown is a baby size cap in Woolease, worked in the round on #7 double-points. Cast on 12 stitches, arrange on 3 needles. You will use the cast-on tail to tighten up the hole later, so leave a long enough tail to work with. Rnd 1: (knit1, slip1) around. Rnd 2: k1, inc 1 twisted, k to one stitch before end of needle, inc 1 twisted, k1. Repeat these two rounds until you have reached the hat circumference you want (infant 12-15", adult 20-23") and have a multiple of 12 stitches (multiple of 4 on each needle). You will now work the sides of the hat in the Eye of the Partridge stitch, working contrast-color patterns of your choice. Rnd 1: (k1, sl 1) around. Rnd 3: (sl 1, k1) around. Bold contrast: Rnds 1 & 3 in MC, Rnds 2 & 4 in CC. Muted contrast: Rnds 1 & 3 in CC, Rnds 2 & 4 in MC. Speckled: Rnds 1, 2, & 4 in MC, Rnd 3 in CC. Work even in EOP stitch for 2 or 3 inches-to cover the distance between the crown of the head and the top of the ears. Work color patterns as desired, for example as shown: one set contrast, 2 or more sets speckled, one set contrast. End with Rnd 4 of EOP, break off CC yarn, and in MC work Rnd 1 of EOP. Each of the earflaps will be worked on ¼ of the stitches, but they will be placed closer to the back of the neck than to the forehead. Calculate ¼ of the stitch count. 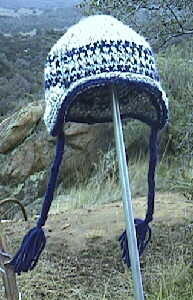 Sample hat is on 84 stitches; 84 ¸ 4 = 21. Subtract one if necessary to give an odd number. Figure the number of stitches for the forehead and neck portions, making the forehead 5 or 6 stitches wider than the neck. In the sample hat I made the forehead 24 stitches and the neck 18 instead of 21 and 21. The beginning of the round is now at the center back. Knit half the number of neck stitches; knit the number of stitches for one ear flap and place a marker (such as a scrap of yarn); knit the number of stitches for the forehead and place the forehead stitches on a stitch holder (and remove marker); knit the number of stitches for the other ear flap and place these stitches on a holder; knit the full number of neck stitches and place them on a holder (you'll be knitting half for the second time). You have only the stitches for the right earflap remaining on the needle. Take a look at your layout and make sure it's symmetrical before you start knitting the earflaps. The earflaps are knitted back and forth on two needles, in the EOP stitch, so rows 2 & 4 will be purled rather than knit. You will work in the MC, and continue the EOP stitch to continue smoothly from the pattern on the hat above (that is, since you've adjusted the location of the flaps, you might be working either (sl 1, k1) or (k1, sl 1) for your pattern row). Row 1 (decrease row): Slip 1 as if to knit (edge stitch), k2tog, EOP across to within 3 sts of edge, SSK (slip as if to knit, slip as if to knit, knit these 2 sts together), k1. Repeat these two rows until 5 stitches remain, ending with Row 2. Final decrease row: Sl1, sl 2 tog as if to knit, k1, pass 2 slipped sts over, k1. Slide stitches from holder onto needle and hold with right side facing you as you begin to knit. Begin knitting with MC, leaving enough tail to work in later. Work as for right earflap. Beginning at the edge of the neck stitches, with right side facing you, attach MC yarn and knit around. Pick up a stitch in each of the stepped stitches on the edges of the earflaps, and knit into the back of loop to tighten it. Knit to center back. *YO, k2tog through back loop, slide this one stitch back onto left needle* Repeat between **s around cap. Break off MC yarn Knit 1 st in CC, then work braid around. In CC, pick up 3 sts at point of earflap and work I-cord for 3 or 4 inches. Attach tassel to end of I-cord. Copyright statement: This is an original design by Judy Gibson, 2006. Permission is granted to print and use this pattern for personal noncommercial use, provided this notice is included. No commercial use or publication of this design--in hard copy or electronic form--are permitted without explicit consent from the designer. Contact: judy@tiajudy.com. Judy Gibson, San Diego, California.